I want to add 2 label classes to one polyline shapefile using x,y coords. Can this be achieved through an expression? I have created the desired output in QGIS and ArcGIS (see image below), but I need to replicate this in MapInfo if possible. Browse other questions tagged labeling mapinfo or ask your own question. Converting ArcGIS style (symbology) to font for MapInfo/OpenGeo? Automatically generating label lines in QGIS? 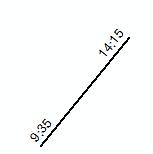 Labeling vertical lines with Shape Length = 0 in ArcMap?